For other people named Albert King, see Albert King (disambiguation). 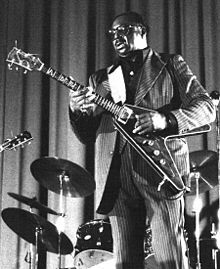 Albert Nelson (April 25, 1923 – December 21, 1992), known by his stage name Albert King, was an American blues guitarist and singer whose playing influenced many other blues guitarists. He is perhaps best known for the popular and influential album Born Under a Bad Sign (1967) and its title track. He is one of the three performers (together with B. B. King and Freddie King) known as the "Kings of the Blues." He was also known as "The Velvet Bulldozer" because of his smooth singing and large size—he stood taller than average, with sources reporting 6 ft 4 in (1.93 m) or 6 ft 7 in (2.01 m), and weighed 250 lb (110 kg)—and also because he drove a bulldozer in one of his day jobs early in his career. King was posthumously inducted into the Rock and Roll Hall of Fame in May 2013. In 2011, he was ranked number 13 on Rolling Stone's 100 Greatest Guitarists of All Time. Nelson was born on a cotton plantation in Indianola, Mississippi. During childhood he sang at a church with a family gospel group, in which his father, played the guitar. One of 13 children, he grew up picking cotton on plantations near Forrest City, Arkansas, where the family moved when he was eight years old. As Albert King, he was famed for his powerful string-bending style and his soulful, smoky vocals. He carved his own indelible niche in the blues hierarchy by creating a deep, dramatic sound that was widely imitated by both blues and rock guitarists. King’s readily identifiable style made him one of the most important artists in the history of the blues, but his own identity was a longtime source of confusion. He stated in interviews that he was born in Indianola on April 25, 1923 (or 1924), and was a half-brother of B.B. King (an Indianola native), but the scant surviving official documentation suggests otherwise on both counts. Nonetheless, he stated that whenever he performed at Club Ebony in Indianola, the event was celebrated as a homecoming, and he cited the fact that B.B. 's father was named Albert King. According to King, his father left the family when Albert was five, and when he was eight he moved with his mother, Mary Blevins, and two sisters to an area near Forrest City, Arkansas. He said his family had also lived in Arcola, Mississippi, for a time. He made his first guitar out of a cigar box, a piece of a bush, and a strand of broom wire. He later bought a real guitar for $1.25. As a left-hander learning guitar on his own, he used a normal string setup and tuning, but played with his guitar reversed, bending strings by pulling them down rather than pushing them up. He picked cotton, drove a bulldozer, worked in construction, and held other jobs until he was able to support himself as a musician. He began his professional work as a musician with a group called the Groove Boys in Osceola, Arkansas, where he moved with his family in 1931. During this time he was exposed to the work of many Delta blues artists, including Elmore James and Robert Nighthawk. Moving north to Gary, Indiana, he briefly played drums for Jimmy Reed's band and on several of Reed's early recordings. He was influenced by the blues musicians Blind Lemon Jefferson and Lonnie Johnson. The electric guitar became his signature instrument, his preference being a Gibson Flying V, which he named Lucy. King earned his nickname "The Velvet Bulldozer" during this period, as he drove a bulldozer and worked as a mechanic to make a living. His smooth vocal style was influenced by R&B pop balladeers, such as the Mills Brothers. King moved to Gary, Indiana in the early 1950s, where he recorded his first single ("Bad Luck Blues" backed with "Be On Your Merry Way"), for Parrot Records. The record sold a few copies, but made no significant impact and Parrot did not request any followup records or sign King to a long-term contract (the label in any case went bankrupt a few years later). Later he moved to St. Louis, Missouri, where he recorded with the Bobbin and King Labels. He moved to Brooklyn, Illinois, just across the river from St. Louis, in 1956, and formed a new band. During this period, he settled on using the Flying V as his primary guitar. He resumed recording in 1959 with his first minor hit, "I'm a Lonely Man", written by Little Milton, another guitar hero, who was then an A&R man for Bobbin Records and was responsible for King's signing with the label. It was not until his 1961 release "Don't Throw Your Love on Me So Strong" that King had a major hit, reaching #14 on the US Billboard R&B chart. The song was included on his first album The Big Blues, released in 1962. However, the other singles that King cut for Bobbin failed to chart at all and he was dropped from the label in 1964. He next signed with jazz artist Leo Gooden's Coun-Tree label and cut two records for them; these also failed to chart. With no apparent career prospects other than touring the club circuit in the South and Midwest, King moved to Memphis, where he signed with the Stax record label. Produced by Al Jackson Jr., King with Booker T. & the MGs recorded dozens of influential sides, such as "Crosscut Saw" and "As the Years Go Passing By". In 1967, Stax released the album Born Under a Bad Sign, a collection of the singles King recorded at Stax. The title track of that album (written by Booker T. Jones and William Bell) became King's best-known song and has been covered by several artists (including Cream, Paul Rodgers, Homer Simpson (with B.B. King on guitar), and Jimi Hendrix). The production of the songs was sparse and clean and maintained a traditional blues sound while also sounding fresh and thoroughly contemporary. As Booker T. Jones explained, the key to King's success at Stax was giving his songs an upbeat, slick R&B feel that made the songs more appealing and radio-friendly than the slow, maudlin traditional blues sound. Another landmark album followed with Live Wire/Blues Power, from one of many dates King played at the promoter Bill Graham's Fillmore Auditorium. The album influenced such notable musicians as Jimi Hendrix, Eric Clapton, Robbie Robertson, Gary Moore and Stevie Ray Vaughan. In 1969, King performed live with the St. Louis Symphony Orchestra. That same year, he released the album Years Gone By. In the early 1970s, he recorded the album Lovejoy with a group of white rock singers; an Elvis Presley tribute album, Albert King Does the King's Things; and a cameo on an Albert Brooks comedy album, A Star Is Bought. The abovementioned tribute album was a collection of Presley's 1950s hits reworked and re-imagined in King's musical style, although critics felt the results were mixed. Lovejoy introduced no really new musical innovations over King's previous two Stax albums, although it notably includes a cover of the Rolling Stones' hit "Honky Tonk Women". On June 6, 1970, King joined the Doors on stage at the Pacific Coliseum in Vancouver, Canada. He lent his distinctive guitar to blues cuts such as "Little Red Rooster," “Money," “Rock Me" and "Who Do You Love." Recordings of this performance were released in 2010 by Rhino Records as The Doors Live in Vancouver 1970. Like many older artists, King wanted to retain his popular appeal and remain on the charts, and so he eagerly embraced the new sound of funk. King was teamed with members of the Bar-Kays and the Movement (Isaac Hayes's backing group), including the bassist James Alexander and the drummer Willie Hall, adding strong funk elements to his music. Adding strings and multiple rhythm guitarists, producers Allen Jones and Henry Bush created a wall of sound that contrasted with the sparse, punchy records King made with Booker T. & the MGs. Among these was another of King's signature songs, "I'll Play the Blues for You", in 1972. The new instrumental arrangements added a renewed freshness to King's guitar licks. In 1975, King's career took a turn downward when Stax Records filed for bankruptcy, after which he moved to the small Utopia label. His next two albums, Albert and Truckload of Lovin' (1976), devolved into generic 1970s pop music. His third album for Utopia, King Albert (1977), while somewhat more subdued, still lacked any standout material, and King's guitar took a backseat to the background instruments. Clara McDaniel teamed up with King at Ned Love's Club. This led to her touring with King in the Deep South in the 1970s. When McDaniel returned home she managed King's fleet of taxicabs. The last recording King made for Utopia was Live Blues in 1977, from his performance at the Montreux Jazz Festival. As the audience here were knowledgeable jazz and blues fans who disliked experimentation, he played it safe and conservative, although As the Years Go Passing By is noteworthy for his duet (and even dueling) with the Irish guitarist Rory Gallagher. In 1978, King moved to a new label, Tomato Records, for which he recorded the album New Orleans Heat. The label paired him with the R&B producer Allen Toussaint, who had been responsible for scores of hits in that genre in the 1960s and 1970s but was a novice at working with blues artists. The album was a mix of new songs (including Toussaint's own "Get Out of My Life, Woman") and re-recordings of old material, such as "Born Under a Bad Sign". King took a four-year break from recording after the disappointing sales of his albums in the late 1970s. During this period, he re-embraced his roots as a blues artist and abandoned any arrangements except straight 12-bar guitar, bass, drums, and piano. In 1983, he cut a new live album for Fantasy Records, Crosscut Saw: Albert King in San Francisco. The same year he recorded a studio television session, more than an hour long, for CHCH Television in Canada, featuring the up-and-coming blues sensation Stevie Ray Vaughan; it was subsequently released as an audio album and later as an audio album plus DVD titled In Session. In 1984, King recorded I'm in a Phone Booth, Baby, which turned out to be his last studio album. The recording included a redo of "Truckload of Lovin'" and two old songs by Elmore James, "Dust My Broom" and "The Sky Is Crying". Fantasy Records tried to recreate the sparse instrumentation of King's Stax years and not drown him out. King influenced other guitarists, including Jimi Hendrix, Mick Taylor, Derek Trucks, Warren Haynes, Mike Bloomfield and Joe Walsh (the James Gang guitarist spoke at King's funeral). He also influenced his contemporaries Albert Collins and Otis Rush. He was often cited by Stevie Ray Vaughan as having been his greatest influence. Eric Clapton has said that his work on the 1967 Cream hit "Strange Brew" and throughout the album Disraeli Gears was inspired by King. King's health problems led him to consider retirement in the 1980s, but he continued regular tours and appearances at blues festivals, using a customized Greyhound tour bus with "I'll Play The Blues For You" painted on the side. Shortly before his death, he was planning an overseas tour. His final album, Red House – named after the Jimi Hendrix song – was recorded in 1992. The album was largely ignored because of bad production quality, and original copies of it are scarce. King died of a heart attack on December 21, 1992, in his Memphis home. His final concert had been in Los Angeles two days earlier. He was given a funeral procession with the Memphis Horns playing "When the Saints Go Marching In" and was buried in Paradise Gardens Cemetery in Edmondson, Arkansas, near his childhood home. B.B. King delivered a eulogy, stating, "Albert wasn't my brother in blood, but he was my brother in blues." On December 11, 2012, it was announced that King would be posthumously inducted into the Rock and Roll Hall of Fame in 2013. At the induction ceremony, Gary Clark Jr. performed King's "Oh, Pretty Woman" and was then joined by John Mayer and Booker T. Jones to perform King's "Born Under a Bad Sign". King has a star on the St. Louis Walk of Fame. King's first instrument was a diddley bow. Next, he built himself a cigar box guitar, and eventually he bought a Guild acoustic guitar. The instrument he is usually associated with is a 1958 Gibson Flying V. In 1974 he began using a Flying V built by Dan Erlewine, and after 1980 he also played one built by Bradley Prokopow. After 1987, Albert played a custom Archtop Flying V, built by Tom Holmes upon commission from Billy Gibbons, it was given to AK for his 64th birthday. This guitar was recently sold by Gruhn's guitar to an unknown collector. King was left-handed, but usually played right-handed guitars flipped over upside-down. He used a dropped open tuning, possibly more than one, as reports vary: (C#-G#-B-E-G#-C#) or open E-minor (C-B-E-G-B-E) or open F (C-F-C-F-A-D). He never used the sixth string. Steve Cropper (who played rhythm guitar on many of King's Stax sessions), told Guitar Player magazine that King tuned his guitar to C-B-E-F#-B-E (low to high). The luthier Dan Erlewine said King tuned to C-F-C-F-A-D with light-gauge strings (0.009", 0.012", 0.024" wound, 0.028", 0.038", 0.050"). The lighter-gauge strings, and lower string tension of the dropped tuning, were factors in King's string-bending technique. For amplification, King used a solid-state Acoustic amplifier, with a speaker cabinet containing two 15-inch speakers and a horn ("which may or may not have been operative"). Later in his career he also used an MXR Phase 90. 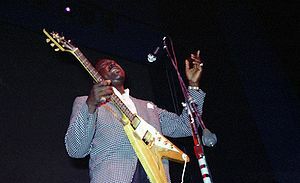 ^ "Albert King (1923–1992) - Encyclopedia of Arkansas". www.encyclopediaofarkansas.net. Retrieved 2019-02-24. ^ a b c d e f g h i Russell, Tony (1997). The Blues: From Robert Johnson to Robert Cray. Dubai: Carlton Books. pp. 72–73. ISBN 1-85868-255-X. ^ Stone, Rolling (December 18, 2015). "100 Greatest Guitarists". rollingstone.com. ^ "Albert King, Indianola". Mississippi Blues Trail.org. Retrieved August 31, 2015. ^ "Brooklyn Legends". Histarch.illinois.edu. 1992-12-21. Retrieved 2017-03-12. ^ a b Robert Palmer. Deep Blues. Penguin Books. p. 246. ISBN 978-0-14-006223-6. ^ Eagle, Bob; LeBlanc, Eric S. (2013). Blues: A Regional Experience. Santa Barbara, California: Praeger. pp. 253–54. ISBN 978-0313344237. ^ Komara, Edward (ed.). Encyclopedia of the Blues. Books.google.co.uk. p. 669. ISBN 978-0415926997. ^ Marshall, Matt (2013-04-18). "Albert King to Be Inducted into Rock & Roll Hall of Fame". Americanbluesscene.com. Retrieved 2015-03-13. ^ "St. Louis Walk of Fame Inductees". Stlouiswalkoffame.org. Retrieved April 25, 2013. ^ a b c Gress, Jesse (May 2011). "Ten Things You Gotta Do to Play Like Albert King". Guitar Player. ^ "How Gibson Flying V Legend Albert King Gave Jimi Hendrix and Stevie Ray Vaughan the Bends". Gibson.com. 2010-04-20. Retrieved 2017-03-12. Bowman, Rob (1997). Soulsville, U.S.A.: The Story of Stax Records. Schirmer Books. ISBN 0-8256-7227-9.